Many of us get into the habit of cramming, especially in college. Back in the day, I used to be able to cram for a few hours the night before an exam and ace it the next day. Well, gone are the days of cramming, especially when you start studying for the CPA Exam. So if you can’t cram, what do you do? You adopt a new method called Pomodoro Technique! The Pomodoro Technique is a method that was developed in the late 1980s as studies began to show that a person’s ability to retain information typically diminishes after about 25-30 minutes. This technique allows you to break your studying up into multiple small sessions or “chunks” with quick breaks in between. Cramming always worked for me in the past, until I started studying for the CPA Exam. It became impossible to understand and memorize multiple topics in one sitting, and I often found myself getting distracted after practicing question after question. I started to get exhausted and realized that not only was I no longer retaining information, but I was wasting precious study time! Try sitting down and studying for 25-30 minutes at a time, taking 10-minute breaks in between. 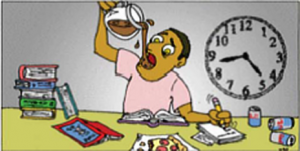 Get up and take a quick walk around the library or coffee shop where you are studying. Grab a snack. Listen to some music. Do something enjoyable! You will find yourself recharged and ready to pick up where you left off once you get back to your study area. Speaking of your study area, make sure you have one! Don’t study in your bed or in front of the TV and be sure to take good notes.